El Salto & Picachos: Both lakes on fire! Best 4 Months yet to come!! As promised in our last update about Comedero, we would be updating you on the fishing at El Salto and Picachos lakes. 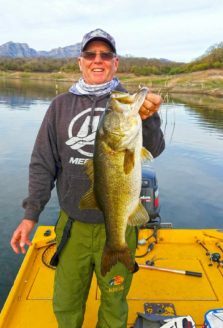 Right now, El Salto fishing is as good as it’s been in a while… and it hasn’t been bad but the past two weeks, the lake is simply on fire! Thus far this season or at least since the first of December, the overall numbers of fish are way up from the previous season. Many boats are catching 80 – 100 bass per day and some catching more than 100 bass per day! This is happening on a rather small lake that’s entering it’s 28th year since opening! Simply amazing! To give you some examples of the overall numbers of bass being caught since early December, here are some reports of recent catches…. 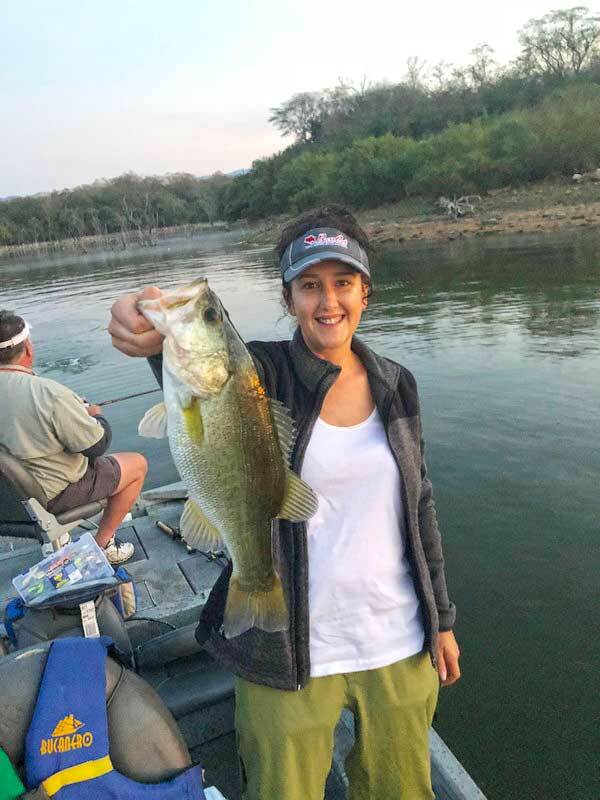 The first week of December, we had Cindy Bednar and her husband David at our lodge and they fished 7 days at El Salto. Cindy/David reported their largest bass weighing 8 lbs… second largest 6.5 lbs. During that early December period, it was much better on numbers than size but everyone that fished during that time reported having “their shots” at big bass. 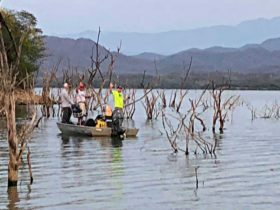 Now fast forward to January fishing at El Salto…. Curt Erpenbach & Jeff Turner landed 90 bass up to 9.3 lbs on green pumpkin Senkos in 2′ – 10′ of water. Ben Palchick & Stewart Beatty landed 101 bass to include two big bass of 10.3 and 8.8 lbs on white Senkos. 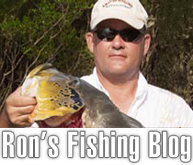 Stewart Beatty, fishing SOLO, landed 105 bass up to 8.2 lbs on green pumpkin Flukes in 1′ – 15′ of water. Stew Malone & Ryan Nelson landed 120 bass up to 7.3 lbs on white spinnerbaits in 12′ of water. Ric Younkin fishing SOLO, landed 93 bass with a 8.2 and a 7.9 on perch gunfish topwater in 2′ – 10 of water. Brad Sayer fishing SOLO, landed 60 bass with his three biggest weighing 8.14, 7.6 and 7.2 on white spinnerbaits in 5′ – 15′ of water. David Pretto & Chris Nattinger landed 110 bass up to 8 lbs on pearl colored Flukes in 2′ – 10′ of water. Josh Lippencot & Brian Homa landed 112 bass up to 7.14 lbs on watermelon red Flukes in 4′ – 10′ of water. Ken Farris & Tommy Took landed 110 bass with a 8.0 caught on Pop-R topwater and a 7.8 caught on watermelon red Fluke. Another happy El Salto fisherman! Today I received a call from J.W. Peterson who is currently (at the time of this writing) at El Salto. 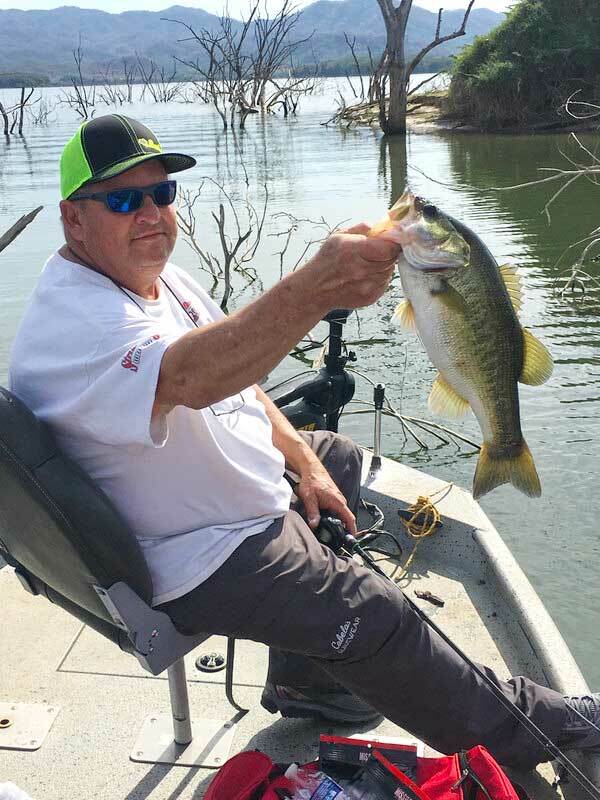 J. W. reported to me that thus far in 3 1/2 days of fishing, he and his fishing partner Joe Earney have landed 481 bass with a 10.3 being their largest (caught by Joe Earney)… and yesterday their top 5 bass weighed a total of 41.3 lbs! As you can see by the recent reports, the numbers are way up this season and yet everyone is still getting their shots at big bass! 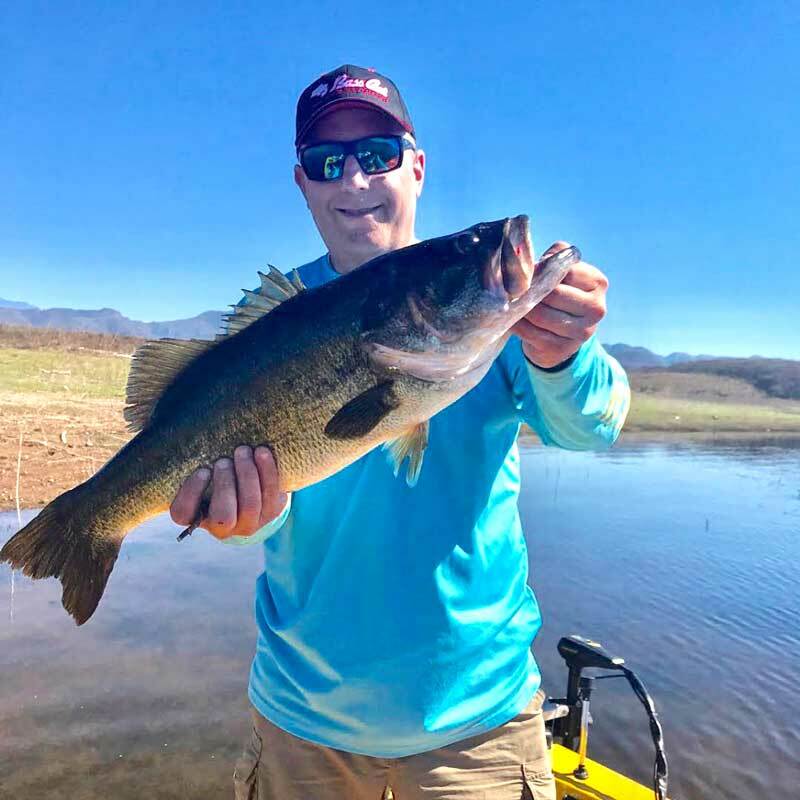 It is not often that anglers have an opportunity to get both — big numbers and big bass — from the same lake! 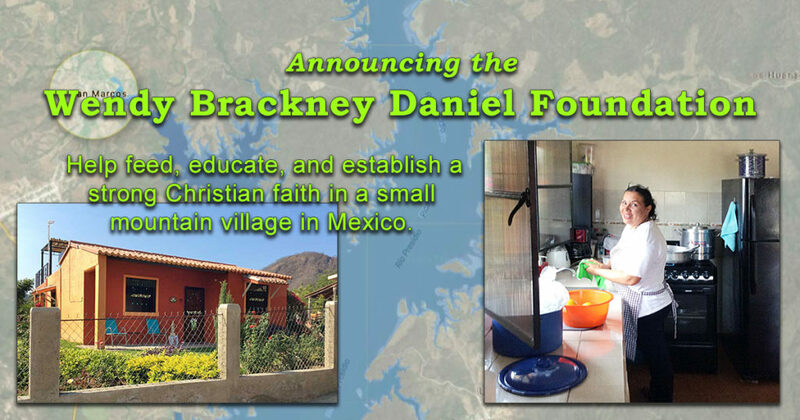 Right now it’s happening at Lake El Salto! El Salto just continues to be great and making a lot of our customers very happy! Our lakeside camp and first class service is a big hit with our customers. 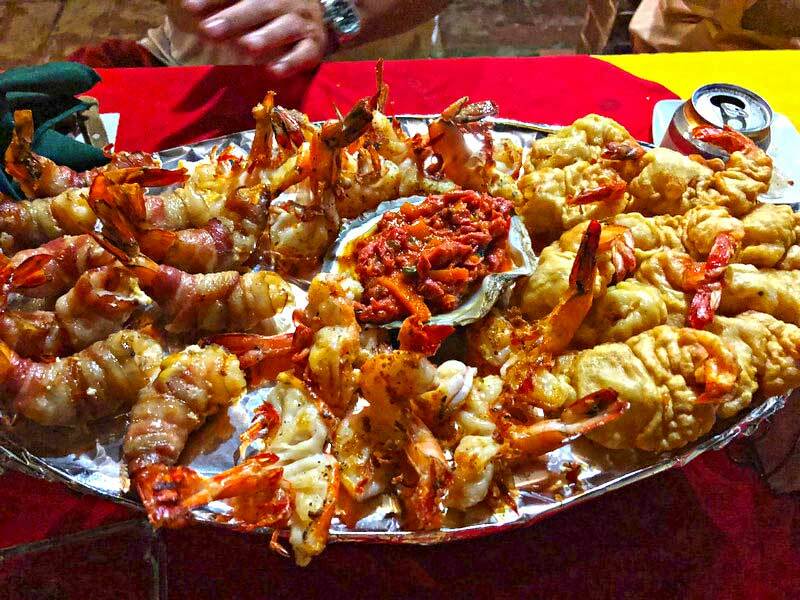 And the food is second-to-none! We offer the best bass boats in Mexico with 18′ all-welded aluminum XPRESS BOATS! Each boat is equipped with a Yamaha 60 HP motor and powerful Minn Kota trolling motors. Also just added are the Lowrance sonars with downscan imaging. Finally, our guides… the most experienced team of guides and they will put you on the fish! Come experience fabulous Lake El Salto with us while it’s RED HOT! LAKE PICACHOS …BEST NUMBERS BASS LAKE IN THE WORLD!!!! There simply is not a better bass lake in the world for fast and furious action than Picachos! Little by little, we see more and more bigger bass showing up. Still, if you’re looking for trophy size bass, then Comedero and El Salto should be your choice. If you’re looking for the MOST ACTION, then Picachos should be your choice… period. Every time I fish Picachos, I leave there amazed… and that is saying something as I have been blessed and fortunate to have been able to fish most of the great bass lakes in the world… not all, but most. Picachos is one of those lakes that is in a stage where it does not matter what the temperature is or what the moon phase is or what the Barometric pressure is doing…. You’re still going to catch fish! That’s because the lake is simply jam packed full of bass! Naturally the fishing is even better when all of the elements of Mother Nature align, but make no mistake about it, when you go to Picachos, you’re going to catch fish, and a lot of them! 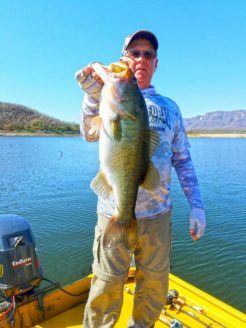 In early January, Rick Pierce of Bass Cat brought his group down to Picachos for some non-stop action. Rick and the group had fished out of our lodge the previous year and absolutely loved it. In fact, that trip one year ago, Rick and his partner broke our all-time record of most bass caught in a single day from one boat of two anglers: 403 BASS IN ONE DAY! That is the best day on the water for numbers that I’ve ever heard of in my 50+ years of fishing!!! That’s almost a bass every third cast when you consider these guys took a 2-hour break for lunch! Now fast forward to this year’s trip…. While Rick and his partner didn’t have 400 bass in a single day, Rick and Stewart Malone did land 220 bass on their second day of fishing. The best single day of fishing of Rick’s group saw Ryan Nelson and Stewart Malone land 250 bass in ONE DAY! I was unable to be with Rick and his group at Picachos for their amazing fishing experience as I was at Comedero during that time for an annual event, but I, along with my Comedero group ran into Rick and his Picachos group in the Mazatlan Airport and the two big groups shared fishing stories. We also had about 8 of my customers that had just fished at El Salto for 3 days… and they wrecked the bass there as well. We all flew back to Dallas on American Airlines’ flight and I would guess that half of that plane was filled with RSJA customers… HAPPY, HAPPY CUSTOMERS… with very sore arms, hands and fingers! I could hear all of these RSJA customers telling other people during the flight about their amazing fishing at all three lakes. It is quite refreshing to hear all of those amazing stories and it’s also a great feeling to know that we can provide THREE GREAT BASS LAKES to our valuable customers. THREE GREAT LAKES, FOLKS! We have everything a bass angler could want… and can even customize a combo of any of the three lakes to fit your bass fishing desire. This was the third trip in three consecutive years for Dave and his group. What does that tell you? I know what it tells me: that there’s a great chance that Dave and group will be returning again next season! Now about the upcoming months on Picachos…. 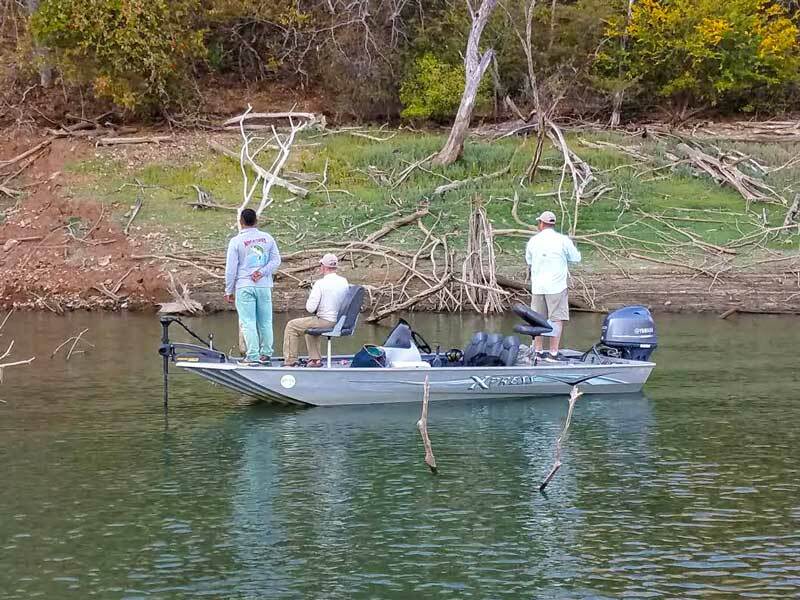 If you have read my updates over the past 3 or 4 years with regards to the fishing at Picachos, then you will know what I think about the fishing in March, April, May and June. These are the best 4 months for trying to catch bigger fish in this lake. Yes, the real purpose to fish Picachos is for numbers. But during those 4 months, the angler has a better chance to not only get numbers but bigger fish opportunities as well. The threadfin and gizzard shad will be spawning in March and April… and in some years into early May. Then May/June those bigger bass bunch up on humps, ledges and points… which allows us to isolate the schools of bigger bass much easier. The numbers of smaller bass in the 2 – 4 lbs class also bunch up in big schools and allow many anglers to sit on one spot all day or a half a day and just catch fish until they can’t cast any more. 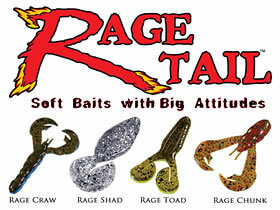 It’s a great great time to get the best of BOTH WORLDS: crazy action/numbers and also chance at bigger bass! Get there before the season is done! I’m positive that you will not regret it! If you have yet to fish this amazing lake and non-stop action/numbers is your cup of tea, then you owe it to yourself to get down there before the inevitable happens… before age, pressure and Mother Nature takes it’s toll. They always do. 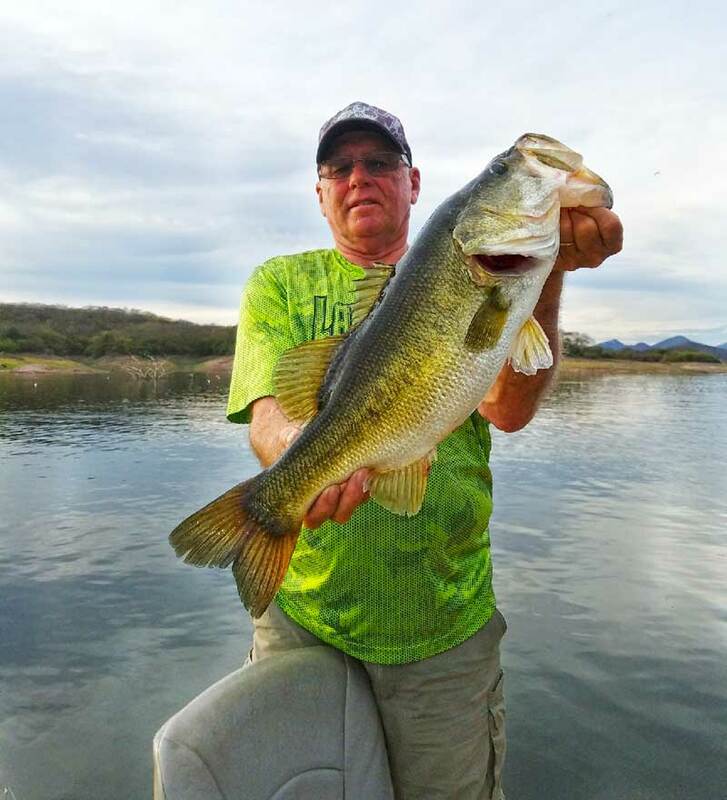 Of course when that happens and the numbers begin to decline, then Picachos will turn into a great trophy fishery… but until that time, come enjoy catching bass until your arms, hands and fingers are sore! Also, we have the largest and nicest lodge on the lake with a breathtaking view of the main lake. Our food and service in all of our three lodges is second to none! No other operator in Mexico is offering all three of these great bass lakes…. none but Ron Speed Jr’s Adventures! RSJA continues to be the leading outfitter for bass fishing in Mexico! XPRESS BOATS….BEST ALL WELDED ALUMINUM BOAT ON THE MARKET!!!! 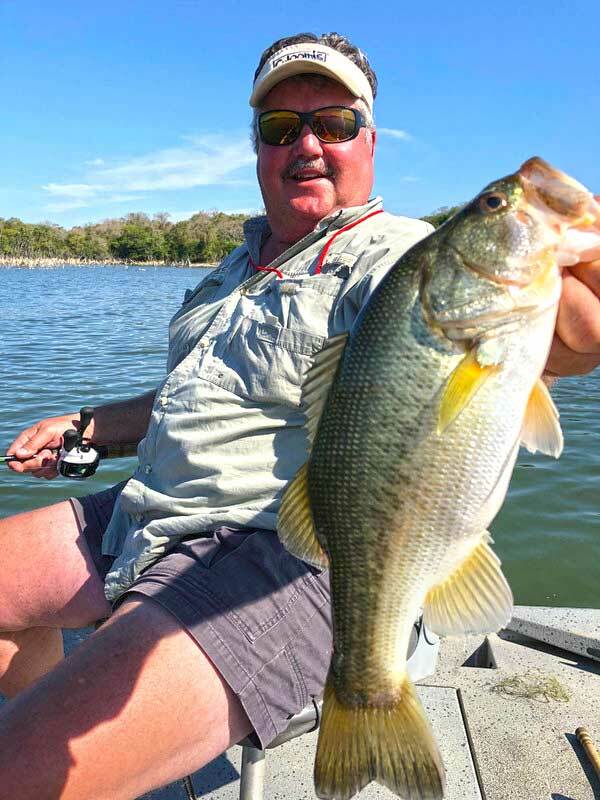 As many of you already know from fishing with us at one of our three lake operations in Mexico, we offer Xpress bass boats at all three lakes/operations. Many of you have returned from your trips and called our office to obtain Xpress dealers’ numbers. That is because many of you have experienced first-hand how great these boats are in Mexico and believe they will be a great boat for fishing your local lakes at home. These boats are designed and built to last forever! They are extremely sturdy and take rough water better than any aluminum bass boat I’ve fished from… on any lake. These boats are built to not leak and that is important when I consider how many other aluminum boats I have fished from over the years (prior to putting these Xpress boats at our lodges in Mexico) that leaked like seals. All three of the lakes in Mexico that we have operations on have a tremendous amount of brush and rocks. The brush and rocks on these lakes do not phase these Xpress boats. They just fish right through and over that stuff. The Xpress boat reminds me of the old Timex watch commercials: “They take a lickin’ and keep on tickin'” Yep, that’s what these boats do! If you’re in the market for a great all-around, versatile boat but do not feel the need for one of the big heavy fiberglass boats with major horsepower, then Xpress should be at the top of your list to buy! Call us today and we will hook you up with one of their dealers… OR you can visit their website www.xpressboats.com. MARTIN TRAVEL SERVICES…THE BEST IN THE BUSINESS!!! As many of you already know, we use and recommend Martin Travel Services in Florida for all of our travel arrangements. If you are not using Martin Travel, then I strongly recommend that you consider them for your future travel needs. I have known Kevin Martin for over 15 years and been using him and his agency for all my travel needs. Their staff is extremely friendly and detail-oriented. They are always available for you and they are very competitive on airfares, hotel stays, vacation trips, etc, etc. Also, on our Mexico trips, we use and recommend the El Cid Resorts in Mazatlan for time spent there. RSJA customers receive a generous discount when staying at the El Cid Castilla Beach Hotel on the beach… but to receive this discount, you must book the hotel reservations through Martin Travel. Martin Travel can book your airfare and hotel stay in Mazatlan in one phone call. Give them a try the next time you travel anywhere in the world. You’ll be a very happy and satisfied customer!